Photo prop courtesy of Ian from Forgottenweapons.com. 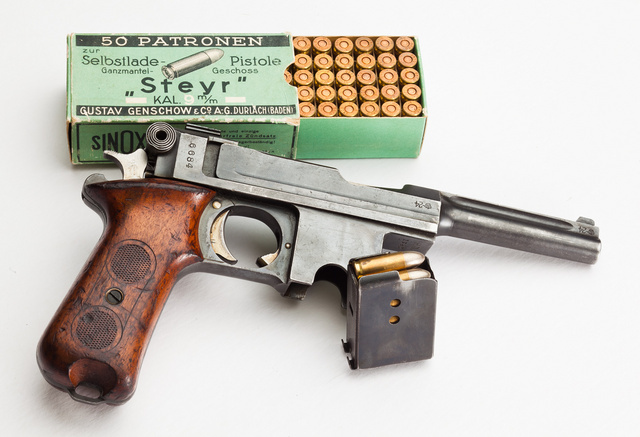 This entry was posted in ammunition, pistol and tagged 9mm, Bergmann, box, cartridge, semi-auto. Bookmark the permalink. Well, it LOOKS scary, so that makes it dangerous, right? While the California ship-of-state founders after striking the hard rock of fiscal reality, our Loonislators continue to employ tens of thousands to redesign the deck chairs in an eco green, gender role neutral, racily sensitive, non-judgmental manner. However, their hate-filled prejudice against firearms owners continues. And yet, if you build it yourself and add a bullet button, an AR pistol is legal. Great photo of a such a “dangerous” pistol, and an effective way to make your point. Do you suppose that anyone has tried to estimate the number of travelers between the Northwest and the Southwest who avoid California (and drive through Nevada and/or Utah) because of their whacky gun laws? Do the Kalifornicans know how many tourist dollars they are shorting themselves? Conversely, I wonder how many of the turistas who wind up in Moab, UT are there because of the CA-avoidance routing some of us regularly take? The control freaks in California don’t care , they are concerned more with power & the ability to micromanage everyday lives of the productive citizen while pandering to the welfare class for the purpose of vote buying. ForgottenWeapons.com: Just what I need, another site for time wasting research. Appears to be a fine specimen . Used to work in a museum & a lot of the artifacts of firearms come to us in less than good condition sad to say.